“Techno-ecological perspectives have become now one of the key directions in contemporary discourses and are part of a larger paradigm shift from new media to post-media art. A range of practices which were once subsumed under terms such as media art, digital art, art and technology or art and science, have experienced such growth and diversification that no single term can work as as a label any more. Traditionally separated domains are brought together to become contextual seedbeds for ideas and practices that aim to overcome the crisis of the present and to invent new avenues for future developments. 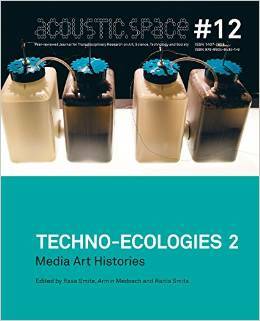 This is the 2nd volume in the Acoustic Space series that continues to build a ‘techno-ecological’ perspective whereby new artistic practices are discussed that combine ecological, social, scientific and artistic inquiries. Edited and published in the context of the exhibition Fields, it makes a perspective its own that sees art as a catalyst for change and transformations. of Resilience , Riga, Latvia, October 5-6, 2012. Contributors: Armin Medosch, Douglas Kahn, Kevin Hamilton, Katja Kwastek, Lauren Fenton, Kuai Shen Auson, Vytautas Michelkevicius, Roberta Buiani, Erich Berger, Laura Beloff, Tega Brain, Brad Miller, Michel Bauwens, Claudia Roselli, Eric Kluitenberg, Heba Amin, Erandy Vergara, Gavin MacDonald, Conor McGarrigle, James Warner, Brian Reffin Smith, Saskia Korsten, Maryam Bolouri, Gabriela Galati, Amos Bianchi, Asa Stahl, Kristina Lindstrom, Eric Snodgrass, Takis Zourntos, Marjan Verstappen, Caroline Langill, Ebru Yetskin. The Acoustic Space journal is published by RIXC, The Center for New Media Culture (Riga), and Art Research Lab of Liepaja University (Liepaja). P2P Trendfest (10): a marketplace for Direct Public Offerings ? ← P2P Trendfest (10): a marketplace for Direct Public Offerings ?